Today’s competitive world makes the phrase “customer satisfaction” more pertinent than ever for running a successful business. In the cosmetics industry, where limitless choices abound, you want your customer to feel that she or he is getting maximum value every time. Until now, the innovation of UV-curing nail polish gels delivered on one front, but not so much on the other. While customers loved the quick, easy drying attribute, often they would get less than a full bottle of product because a portion of it would dry out too quickly. Now, however, Bottle Coatings’ new patent-pending powder coating technique safeguards UV nail gel by coating the entire glass container and blocking out troublesome UV light. This enables you to offer your customer 100% yield of the product inside. No other coating offers that level of light protection and UVA/B blockage. Let’s face it…customers don’t like to waste their money. When the product dries and hardens in the bottle, they think negatively of the brand and look elsewhere to make their next purchase. At Bottle Coatings we’ve perfected the process so that the powder withstands chemicals and harsh conditions, assuring your customer of round-the-clock gel protection and full usage of the product. Protect your brand, protect your business…and grow your customer base with the latest innovations inside…and outside…the bottle. With Bottle Coatings technology, you can stay cutting edge with confidence. The beauty of nail polish gels is that they come in so many different color hues, shades and textures. On the other hand, the problem is that they come in so many different hues, shades and textures. By providing so many different color choices, you greatly increase your customer base. Today, however, with the popularity of UV-curing gels, you must package them in bottles that shield the gel from UV rays. So how do you possibly paint bottles to match that dizzying array of colors? After all, your customers want to know the exact color that they are purchasing. Fortunately, Bottle Coatings has developed a highly accurate color matching system so that our powder coated bottles effectively duplicate the color of the product inside. We can work from your custom specifications, providing you with thousands of different color choices. Choose from variations like glossies, metallics, glitters, hammer tones and more. Our expert staff is highly skilled in this precision process. We have produced more than 180 different colors for our clients and continue to expand our color options. Handling orders of 50,000 to 5 million or more, we can work with you to match your color needs. Keep in mind, also, that powder coated colors such as these will not fade or discolor with time or exposure to light. When it comes to accurate color matching, no one bottles creativity like Bottle Coatings! 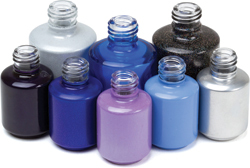 Customers rely on Bottle Coatings for quality service, which means not only resilient, durable coatings with color accuracy, but also quick, hassle-free delivery. We strive to make the delivery process as easy as possible for you. Merely ship us your empty bottles, and we will professionally coat them, then send them back to you right away so that you can fill your bottles and send them out to your own customers as expeditiously as possible. If you don’t have your own nail polish bottles…no problem. We can supply you with those bottles, with virtually any number count that you desire. Because our parent company, SunDial Powder Coatings, is a highly innovative powder coating company with more than 30 years of experience, we have a well-developed supply chain and job processing system. Large orders and tight deadlines have been part of our business for decades. We are able to move product rapidly, while applying all of our quality control mechanisms. The result is that you can place your order with confidence, knowing that Bottle Coatings will process it efficiently, handle it professionally and deliver it quickly. The art of powder coating has earned many fans and followers over recent years. It is hailed for its attractive appearance, its scratch resistance and general durability, its rich color and its versatility. Just as important, powder coating is an environmentally friendly process. Other processes, such as wet painting, require various preparations that can adversely impact the environment. Harmful fumes and carcinogens can fill the air once the carrier solvents evaporate. Powder coating, on the other hand, applies fine grade compounds to electrically charged objects and heats them to melt the compounds. There are no harmful solvents used, so negligible, if any, amounts of volatile organic compounds (VOCs) are released into the atmosphere. In essence, the powder is virtually pollution-free, with close to 100% efficiency of particle transfer. Electrostatic processing is also low energy-consuming, and unused or oversprayed powder is easily recovered. This minimizes waste and allows for easy, safe disposal. Many companies that utilize powder coating earn important LEED credits that demonstrate they are using green technology. Check to see what kinds of credits or tax benefits you might be eligible for when utilizing technology such as powder coating. Above all, you can be proud that you are playing a role in promoting a green future.